Although many medical interventions in ancient Rome were fairly misguided, the Romans did come up with some revolutionary medical practices that put them at least on a par with the skilled medical professionals from ancient Greece. Roman medical practitioners displayed an impressive ingenuity when it came to healing wounds and injuries. They developed some rather bizarre but useful medical tools like the weirdly named and fearsome-looking vaginal speculum. Not all Roman “doctors” were highly regarded – most of them were considered frauds and liars. However, the surgeons in the Roman legions were much more respected for the skill they displayed in healing injured soldiers on the battlefield. They came up with bandages made from cobwebs, vinegar, and honey, a combination that proved to be vital for a speedy recovery. In fact, their medical achievements formed the basis of military medical practices for nearly two millennia. In ancient times, the popularity of a piece of clothing was directly related to its simplicity and ease of wear. Generally, two types of clothing were popularly worn by the ancient Romans: the tunic and the toga. The tunic was the standard dress for most people, worn by slaves and non-citizens all the time, and by Roman citizens at leisure in the comfort of their own homes. The toga was seen as a distinctly Roman item of clothing which only true Roman citizens were allowed to wear in public. It was especially worn on state occasions and is synonymous with the modern-day tuxedo. Given their design and texture, togas obviously weren’t the most comfortable of outfits, but the ancient Romans loved to show off their status and power by wearing togas in public. Togas came in two primary colors: white and purple. Purple clothing was a symbol of royalty and was reserved only for emperors and influential senators. For anyone else, wearing a purple toga was considered treason and was highly punishable. Ancient Rome was known for the foundations it laid and advances it made in contemporary architecture, effectively making Rome a pioneer civilization, inventing and implementing breakthrough architectural techniques. The primary architectural achievements that stand out are the modified arches (used in creating structures like the Colosseum, aqueducts, and sewers) and the extensive network of roads throughout Rome that proved to be pivotal in establishing far-reaching business routes across the empire. Roman concrete was known to be strong and long-lasting. Moreover, on analyzing pieces of Roman concrete that had been buried deep in the Mediterranean Sea for more than 2,000 years, researchers found that it was more durable and environmentally friendly than its modern-day equivalent. 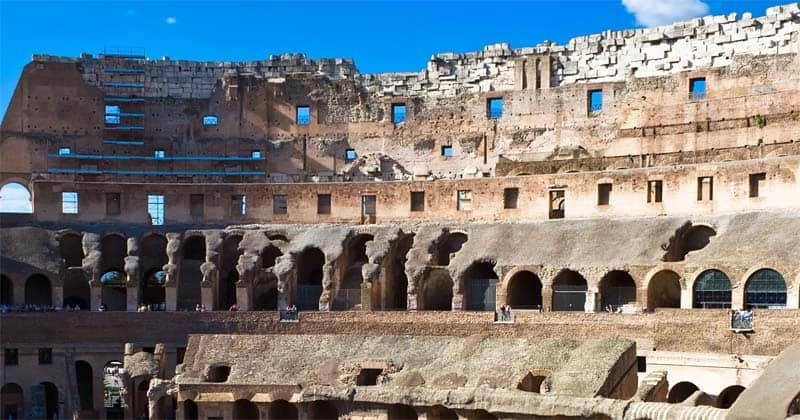 Modern concrete structures are designed to last for a couple of centuries at most, but those ancient Roman concrete slabs were able to withstand more than two millennia of seawater corrosion. The ancient Romans were the first to invent and use supermarkets. There were already all kinds of shops in Rome selling a variety of goods, but a complex of buildings was constructed from 107 to 110 AD during the reign of Trajan. A fine example of decorative architecture in imperial Rome, the complex housed a whole market, along with a residential apartment block and small shops at the front. At the peak of its popularity, Trajan’s Market contained more than 150 shops. The primary products sold at the market came from all across the Roman Empire. The most popular were food items such as fruits, vegetables, fish, wine, oil, and various spices. Since this structure was built using Roman engineering techniques and a whole lot of ancient Roman concrete, it still stands to this day as a testament to the durability of ancient Roman architecture. For the average citizen of ancient Rome, a regular diet consisted of common staple foods such as wheat, barley, bread, and posca. Meat and fish were rare delicacies for the poor, but rich Romans could afford pretty much anything. Almost all of them loved to show off their riches and lifestyles, so they would host extravagant dinner parties where their slave cooks would prepare amazing meals and delicacies for the invited guests. The dining room was the primary reception space full of attractive decorations such as floor mosaics, wall paintings, and other luxurious artworks. The dinner would consist of three fancy courses and the lavish cuisine was served more with the purpose of adding flamboyance to the dinner party than to satisfy the appetites of the guests. 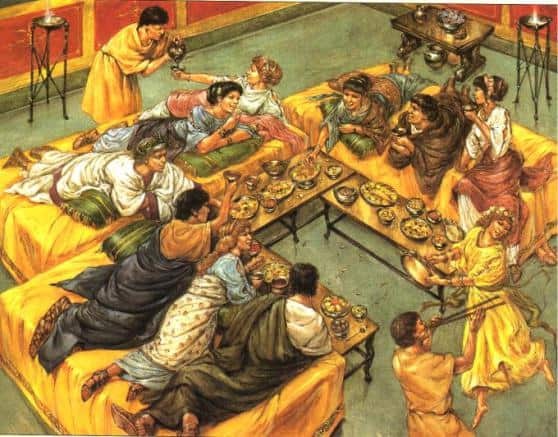 In fact, it mattered far more to the rich Romans that their meals were a grand spectacle; the taste was almost always of secondary importance. Throughout history, left-handed people have faced social bias since almost all the tools of daily life are made with right-handed comfort in mind. But the Roman prejudice against left-handed people went well beyond that. They were considered unlucky or evil by the right-handed majority (who make up about 90 percent of the population). In ancient Rome too, you were believed to be unlucky and untrustworthy if your dominant hand was the left. Even the word “sinister” is an iteration of the original Latin word meaning “left” but soon became synonymous with “evil” because of contemporary superstition. Though history books suggest the ancient Romans actually believed the left side to be lucky in the beginning, they eventually switched to the Greeks’ way of thinking who considered the right side to be lucky. In no time, the left hand had attracted such negative symbolism that the ancient Greeks and Romans actually wore the wedding ring on the third finger of the left hand to ward off the evil that came with lefties. 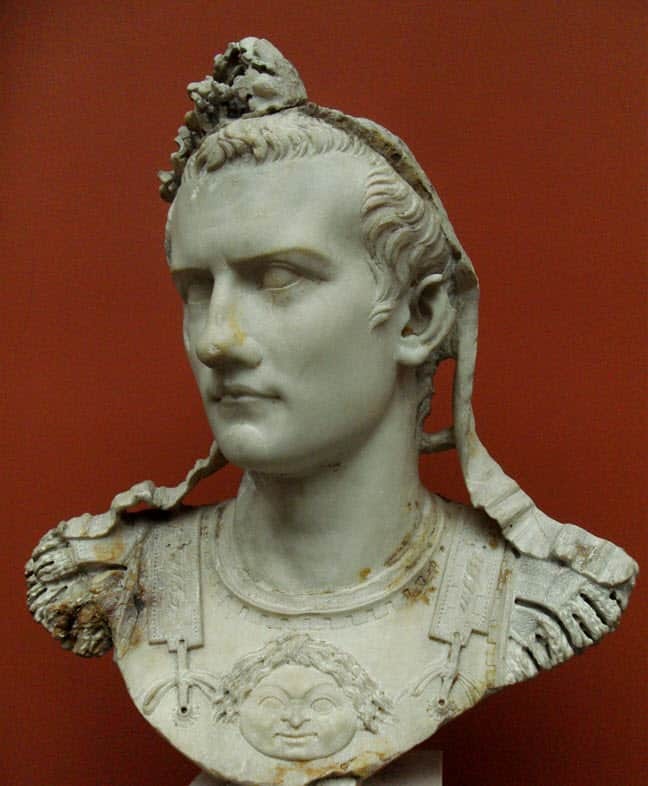 “Little Boots” Caligula’s reign as emperor of imperial Rome lasted for only a few years, but stories of his various antics and notoriety have lived to this day. Even though he started out as a popular emperor, and in fact was revered by all in the first few months of his reign, his behavior soon became so immoral and unreasonable that almost everyone believed he had become insane. This belief is understandable when the supreme leader of a vast empire decides to install his pet horse as a priest and counsel in the Roman Senate. He made frequent appearances in public dressed as a woman, and abandoned the customary toga for silken gowns. He even directed his guards to use obviously feminine hand-signs when signaling each other. He met a horrendous end when he was murdered by Praetorian guards and senators who left his body to rot in the street. Even today, it is a hassle to pay to use public toilets – why should one be charged to perform a natural bodily function? But even the common citizens in ancient Rome had to pay a certain amount of tax to use public urinals. As it happens, in those days, urine was seen as a commodity as it had various uses. 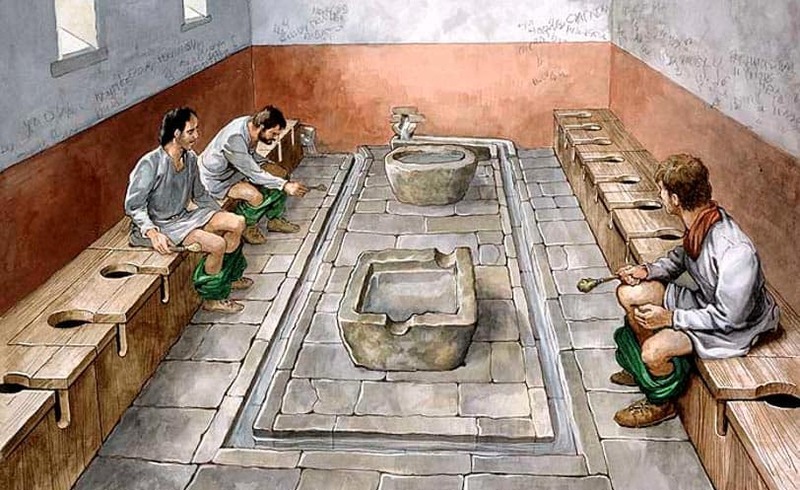 All the urinals would lead to cesspools from where the liquid was collected (along with the liquid from the cesspools of private toilets in upper-class Roman residences) and then recycled for various chemical purposes. Animal skins were dipped and soaked in urine to remove hair fibers. Processed urine was extensively used for laundry purposes since it was a source of ammonia, which came in very handy for bleaching and cleaning woolen garments. Consequently, first Emperor Nero and then Vespasian levied the vectigal urinae or urine tax. The ancient Romans may have made some huge advances in architecture and medicine but they were blatantly superstitious – in fact as superstitious as you can get. A popular superstition among the Romans was that good health and luck was associated with the phallus, making it an ever-present amulet or effigy in ancient Roman society. It was common in Roman households to hang up wind chimes that bore various phallic amulets to ward off any evil or sinful influences on the family. Not that all the wind chimes bore phalluses. Other amulets such as lions’ feet and birds’ wings were also used as chimes. There also used to be a sacred phallus that the priestesses of the goddess Vesta (Roman goddess of the hearth) would keep to ensure the security and welfare of the Roman state. The foundation of ancient Rome is more the stuff of legend and myth than fact. One of the most popular legends states that ancient Rome originated on April 21, 753 BC. This myth is backed up by the archaeological discovery of early settlements on Palatine Hill which date back to around 750 BC. Two very interesting founding legends exist in the ancient Roman mythos: Romulus and Remus, and Aeneas. The first one states that two demigod brothers, Romulus and Remus, laid the foundations of Rome but then had an ugly argument about who got to rule the city. Romulus ended up killing Remus and named the new settlement after himself. It is arguably the best-known folklore on the origin of Rome, but there is also the legend of Aeneas. The Aeneas of Troy folklore does not contradict Romulus and Remus, but rather names Aeneas of Troy as the people’s ancestor, linking the myths of Rome and Troy. These facts encapsulate the impressions we have formed about ancient Rome and the lifestyle of contemporary Romans. As the saying goes, Rome wasn’t built in a day – it started as a small settlement and eventually became one of the greatest empires to have ever existed in the history of human civilization. The Romans were greatly influenced by the Greeks’ way of life, but they also differed from the ancient Greeks in many ways. They enjoyed spectacle and grandeur, but mostly despised an overload of philosophy. Their doctors weren’t as influential as their Greek counterparts, but they made giant leaps in battlefield medicine. And they did leave a legacy of their own that lives to this day. Can you get some good information on the sacrifice practices of Ancient Rome. I remember reading that human sacrifices were done to Diana (maybe others). Recently I read that sacrifices of both animals and humans were rare or not at all. Sacrifices all over the ancient world, (especially humans) were very prevalent. The story of Abraham and Isaac was God’s way of putting an end to child sacrifice which was common in that part of the world by pagans. Can my memory be faulty? Thank you! Hey, from what I can recall, human sanctifies were very rare. There were a few myths, like a Greek officer sacrifing his daughter to the gods for military success but that’s it. Animal sacrifices were common. If you look it up you can find what animal you would have sacrificed during different situations. However, the Romans believed that the gods would want the fat of the animal given to them because it looked better. The people would then eat the meat and burn the fat in the hearth to satisfy their deities.